Only in America! For most countries of the world sport conjures up images of health, fitness and exercise but at sports stadiums across the U.S.A. they are creating stranger and stranger half-time snack food. Check out these totally crazy food snacks. The Outside Corner has the full list of these bizarre food creations on their fantastic blog. 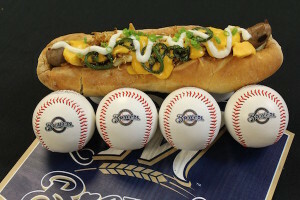 The Down Wisconsin Avenue Brat can be bought at the Milwaukee Brewers and is made with a 45.5cm bratwurst covered in fries, gravy, cheese curds, cheese sauce, fried sauerkraut, jalapeños, sour cream, and chives. 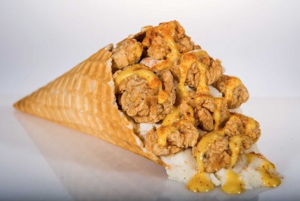 Houston Astros have introduced the Chicken & Waffle Cone. Chunks of fried chicken served on a bed of mashed potatoes, drizzled in honey mustard and wrapped in a handy waffle cone. What? No ice-cream?? Finally, the College Daze Bloody Mary from the Minnesota Twins mixes two popular treats into one. 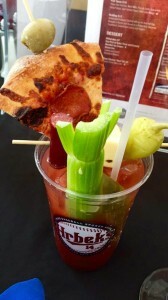 It’s a Bloody Mary garnished with a slice of cold pepperoni pizza. Nuff said I think.